The Indo-Pacific Humpback dolphins are medium-sized delphinids that can be found in coastal waters of the Indian and West Pacific Oceans. In Australia humpback dolphins occur from approximately the Queensland – New South Wales border to Ningaloo Reef in Western Australia although few sightings have been reported as far as Shark Bay. Within this range humpback dolphins are found primarily in inshore coastal waters with preference for estuaries, coastal inlets and bays. In Australia Indo-Pacific humpback dolphins measure and weight up to 2.80 m 280 kg respectively. The dorsal fin is short, slightly curved and triangular in shape while the prominent hump, typical features of the other regions, is absent. Adults are pale grey, with a dorsal fin, rostrum and melon that whiten with age. Calves are mostly dark grey above with a lighter ventral surface. Humpback dolphins are opportunistic-generalist feeders preying on primarily on fish associated with shallow, inshore and estuarine habitats while cephalopods, decapods and bivalves represent only a small fraction of the diet. Due to their coastal and estuarine distribution, Indo-Pacific humpback dolphins are particularly vulnerable to human activities in and adjacent to coastal areas. At the present, humpback dolphin is classified as “Near Threatened” under the Queensland Nature Conservation Act 1992, and listed as migratory species under the Environment Protection and Biodiversity Conservation Act 1999. 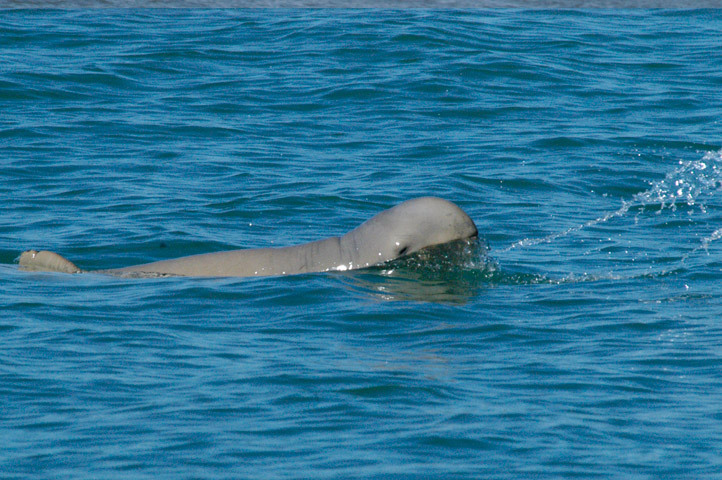 The Australian snubfin dolphin formerly known as Irrawaddy dolphin (O. brevirostris) was recognized as separate species in 2005. 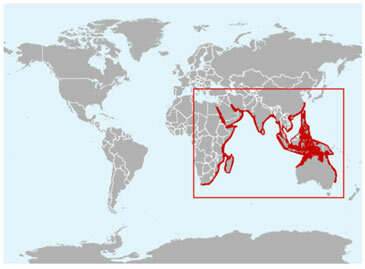 Their distribution is restricted to tropical and subtropical coastal waters of Australia and possibly Papua New Guinea (Beasley et al. 2005). In Australia, snubfin dolphins are found from Broome, Western Australia, to the Fitzroy River, Queensland showing preference for coastal and shallow (less than 15 m) waters, especially near rivers and creek mouths. Australian snubfin dolphins are generally found in small groups of 2–6 animals, although larger groups may be observed in areas with high concentration of food resources. These animals are generalist feeder, potential preys include fishes, squid, cuttlefish, octopus and shrimps, all species associated with shallow, inshore and estuarine habitats.